Alaric betrayed everything he believed to save Evangeline — and failed. His last chance to save the woman he loves lies in an ancient Wellstone, a repository of power, buried and lost long ago. Luck—or something more troubling—leads him to a small group searching for the same stone. and an elf with an unsettling amount of power. If he can gain their trust, they might help him find the cure. But the Wellstone holds more than he knows, and a terrible evil he’d thought defeated is stirring again, searching for the stone. Can the companions survive a traitor, a dragon, and their own pasts to reach the stone before time runs out? A Threat of Shadows was 2018’s Self-Published Fantasy Blog Off (SPFBO) Semifinalist (hosted on Mark Lawrence’s blog here) and I think it certainly earns it. Andrews’ writing style is amiable, clear, and engaging. I found it easy to slide into Alaric’s POV, understand his motivations, and empathize with his justifications for his actions, even while the author creates and holds tension about the morality of his emotional decisions. Plot action happens right away and sets the stage for the rest of the book. Magic and monsters abound, and even with all the traveling that is endemic to epic fantasy, the narrative is exciting and delightfully fast-paced. Furthermore, Andrews displays exceptional emotional acuity through her relatable, well-written supporting characters and in her ability to make their tragedies impactful. 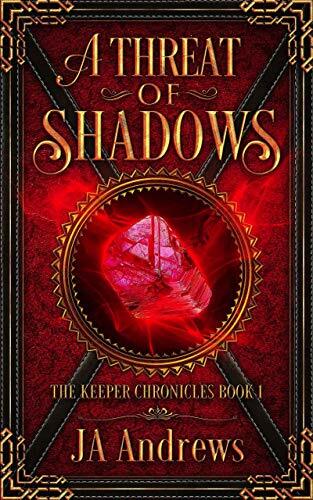 Overall, I thought A Threat of Shadows was an enjoyable book and easy recommendation for anyone who likes epic fantasy. While I’m still deciding if I liked the book’s conclusion (which I won’t give away here! ), it was appropriate. I also appreciated that it wrapped up the plot without cliffhangers while simultaneously leaving the world open for its sequel, Pursuit of Shadows. Have you read A Threat of Shadows? What did you think?